WE DO NOT SELL BARRELS. This information is free, use it as you wish. 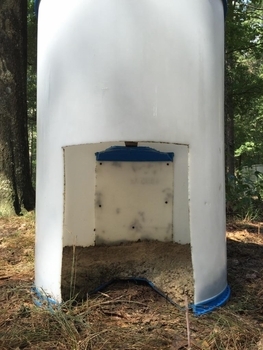 If you are looking for a barrel design that helps keep your birds alive by protecting them from varmints and getting them out of the weather, here is what I came up with for my own birds. 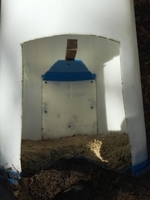 The roost piece is what is cut out of the barrel to make the entrance hole. Cut an approximately 13" wide by x 16" tall piece out of the side and continue cutting into the bottom of the barrel a 12" long piece that is triangular in shape for the roost board to be attached to (the piece that is cut out of the barrel will be L shaped). 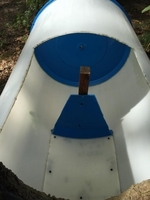 The plastic is turned upside down to fit perfectly inside the barrel with a 2"x2" x 16" long board used as a roost (screw to the piece that was once part of the bottom of the barrel) Also, put a screw through the barrel into the end of the roost board to help hold it straight and level inside the barrel and fasten the plastic piece to the barrel with sheet rock screws that are broken off afterward and sanded down smooth, so they are flush with the outside of the barrel. 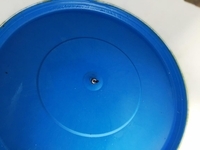 The roost should be just above the top of the opening in the side of the barrel, so that it is not seen when walking by the barrel, you have to bend down and look up inside the barrel to see the roost. 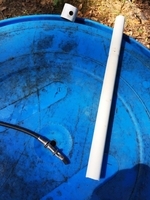 USE WHITE BARRELS ONLY, in order for this set up to work, as other colors make it too dark inside the barrel as the sun gets low and begins to set (roosting time). 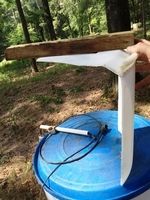 You may have to "teach" the birds to go inside and roost, by going around your yard and getting roosters off the tops of barrels and putting them inside, the first 3-4 nights they are put on the cords with this type barrel. Most birds will roost inside on their own free will after doing this a few nights, as they know it's safer than roosting out in the open....maybe, or it could just be a habit, as chickens aren't really too smart! lol Of course, there will always be a stubborn few that will prefer to roost on top the barrel, especially in the summer, but it should be less than 10% of the roosters. Owls will not get the birds inside the barrels, and four legged varmints won't get them as quickly as they don't see them without investigating the barrel close up. 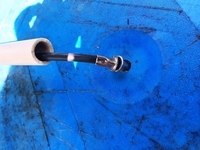 The rubber cord is fastened to the barrel in a hole in the center of the top of the barrel, by using 3 rivet caps, one crimped on the cord inside the barrel, one not crimped which sits in the hole through the barrel itself to keep the rubber cord from rubbing the plastic inside the hole, and one on top of the barrel crimped on the cord, against the rivet that is in the hole (against the non-crimped rivet). This keeps the non-crimped rivet inside the hole at all times so the rubber will not wear out from rotating and rubbing against the plastic. 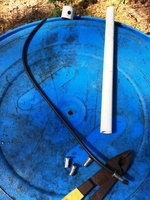 The long piece of 1/2" PVC goes over the rubber cord and lays on top the barrel for the same type purpose, so the rubber does not wear out from sliding against the barrel constantly. Cords like this will last for many years, especially if using the rubber cord slip hitch like I do. 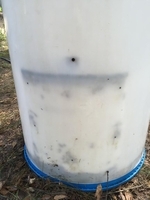 I used some cement in the bottom to weigh down the barrels and also threw some dirt on top the cement, this holds the barrel down so it won't tip over. I'm sure several other methods would work if you like some other way of keeping the barrel in place.